From helping baby green sea turtles survive their first walk to the ocean to volunteering in a storm-damaged Texas community, 30 of Caltech's undergraduate and graduate students recently took part in a unique program designed to make spring break a valuable learning experience. 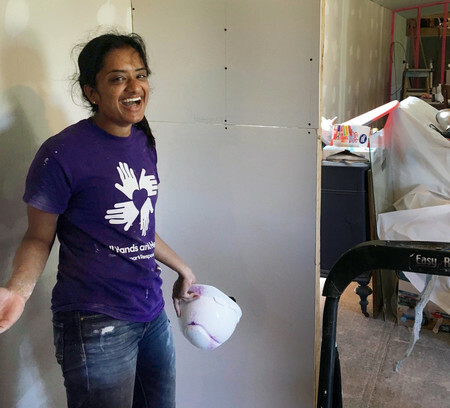 In Texas, junior Meera Krishnamoorthy installs drywall in partnership with All Hands All Hearts, an organization that rebuilds homes after natural disasters. For the past 30 years, the Caltech Y's Alternative Spring Break program has offered participants an opportunity to make tangible contributions to local communities while gaining a broader understanding of the world. This year, students split into three groups that traveled to Costa Rica, Texas, and San Francisco. In Costa Rica, students volunteered with Osa Conservation, a group focused on the globally significant terrestrial and marine biological diversity of the Osa Peninsula. During their visit, the students learned about ecosystem stewardship and creating sustainable economic opportunities, and took part in shepherding baby green sea turtles across the sand to the ocean. "This was my first Y international trip and a very memorable one," says student leader, Aishwarya Nene, who traveled to Costa Rica. "It was very gratifying to help the Osa Conservation research scientists on a multitude of projects and gain a deeper appreciation for the rainforest." Another group visited the San Francisco Bay area to explore how technology affects society through informal discussions with staffers from Uber and Google, among others. The third group trekked to Aransas Pass, Texas, to volunteer with All Hands and Hearts, a nonprofit organization serving the immediate and long-term needs of communities post natural disasters. Aransas Pass was one of the areas hardest hit by Hurricane Harvey. Sophomore Noelle Davis, who was the student leader of the group, says she was deeply affected by the plight of community members struggling in the aftermath of Hurricane Harvey but gratified by the opportunity to work on an elderly woman's home that had been ravaged by the storm. She says seeing fellow volunteers "devoting their lives to helping those affected by natural disasters has motivated me to seek a career path with the same purposefulness. If a picture is worth a thousand words, then an experience is worth a million." Caltech Y Alternative Spring Break trips were made possible with generous funding from the George W. Housner Student Discovery Fund and the Frank and Elsie Stefanko Fund.